The enigma known as Mike Tyson was an alpha speciman to behold in his prime, who further refined his physical gifts through monotonous but effective workouts. Though he’s only 5’ 10”, short for a heavyweight, what he lacked in height he made up for in good head movement, lightning quick hand speed and pure punching power. Let’s take a look at 5 of the best exercises Mike Tyson performed to improve his physical conditioning and technical abilities in the ring. Just one look at Mike Tyson’s thick neck tells you that he’s born with freakish genetics and that he must do some insane workout to get it so muscular. Perhaps one of Tyson’s most well known exercises is the neck roll where he gets into a crab position, but only uses his head and feet to maintain that body posture. Then he proceeds to roll his head around on a folded towel (which prevents slipping) and as a result, the neck muscles are strengthened due to the resistance at different positions. 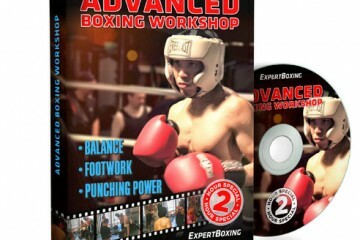 There are variations of this type of exercise as seen being performed by Gennady Golovkin, which looks slightly safer to do, so give that a try before doing this. Getting hit around the abdominal muscles with a heavy medicine ball a few times doesn’t seem so bad, but when you’re a supremely conditioned fighter named Mike Tyson, a few times just isn’t enough. 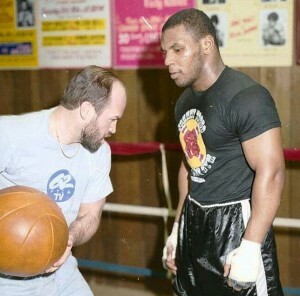 As seen in the video above, Kevin Rooney (Mike Tyson’s former trainer) forcibly throws a large medicine ball around Tyson’s abs while Tyson tenses and breathes out to brace the impact. You may have also seen other people doing this exercise laying down in a crunch position instead which provides the same results but there’s often a bigger impact because of gravity..
Having a medicine ball thrown repeatedly at your abs helps to strengthen muscles around that area which allows you to absorb body punches better when you’re able to see them coming. However, taking a well placed body shot when you least expect it can still knock the wind out of you because you won’t be able to prepare your body for the impact. You can never go wrong with keeping it simple. One of the most effective exercises anyone can do to strengthen their abs is ab crunches, and lots of them. It’s an exercise that has stood the test of time and in a combat sport, you’ll be a fool not to incorporate it into your workout. When performing an ab crunch, do not go all the way down as you’ll end up straining too much to get back up. This is a good way to damage your lower back. Instead, go down about ¾ of the way so that it’s easier for you to perform a crunch without losing any effectiveness. When you’re doing a high amount of reps, your form can begin to falter as you tire, which is why it’s better to either have someone hold down your feet (just like how Tyson is doing in the video) or use an ab bench. Securing your feet as you do ab crunches ensures that you’re properly working out the right muscle groups. You’ve probably seen footage of Tyson’s earlier fights where he’s making his opponents clumsily miss punches by swiftly moving his head from side-to-side. His ability to evade punches and get within range of his opponent was vital because of his reach disadvantage, and it was a staple in his prime. 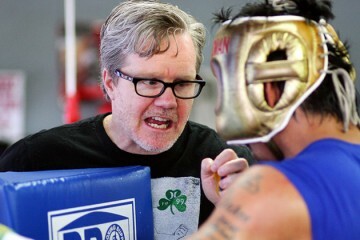 Tyson’s ability of slipping punches in the ring didn’t come natural to him, but it was a habit that was drilled into him by his former trainer Kevin Rooney. This is where the slip bag comes in. The slip bag is a small weighted bag hung from above the head and swings around freely in any direction. As it swings back and forth (mimicking straight punches), you move your head from side-to-side to avoid the bag hitting any part of your face or head. 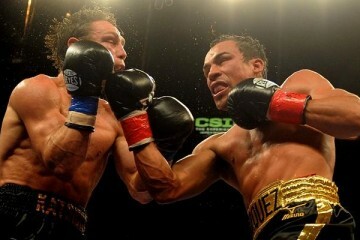 The trick isn’t to use your head to avoid the bag, it’s to use your waist, which Tyson was so good at. Watch him in action on the slip bag and you’ll see that much of his movement is focused on his waist. The bob and weave style was Tyson’s trademark, but it didn’t just involve slipping straight punches; you had to duck under hooks too. Many boxers bend from the waist to bob under punches, but the correct way is to bend at the knees without crouching forward too much, like you’re performing a squat. 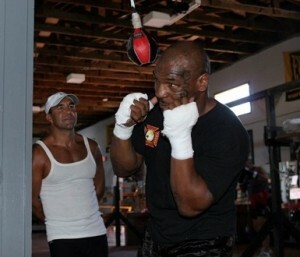 Tyson practiced this technique over and over again in training, with his trainer simulating a fight situation by throwing straight punches and hooks at him, while Tyson must bob and weave and come forward at the same time. He got to the point where he was able to do this with great speed and fluidity. When Tyson combined his bob and weave style with the peak-a-boo guard, he was truly a difficult target to hit cleanly. 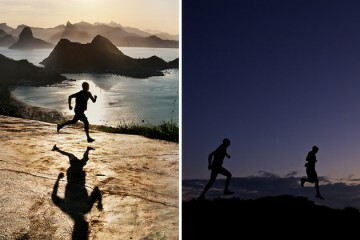 It wasn’t until he changed trainers and began slacking in training that his head movement all but disappeared.